Clicon is a program that is targeted at Spanish users only; however, many users living in other countries download and install it themselves because it might seem to be a very useful program. If you read the information provided on its official website cyclon-gems.com, you will soon find out that Clicon promises to provide you with the best offers, discounts, and coupons. It also claims to be able to enhance your browsing experience. Actually, we have to upset you by saying that Clicon is not going to act in a beneficial way, so if you have already installed it on your system, you should definitely delete it as soon as possible. Luckily, it is possible to erase this application via Control Panel. Of course, we will help you to do that if you know nothing about malware removal. The specialists at pcthreat.com believe that this program might display various types of commercial advertisements; however, it is very likely that pop-ups will appear on your screen the most frequently. They might interfere with your daily activities on the web. In addition, you have to be careful with all those ads as well because clicking on them might end in disaster. By saying that, we mean that you might encounter malicious software. It has been found out that Clicon is not responsible for your safety, which means that it is rather risky to use Clicon. You should know that Clicon might perform other undesirable activities as well, so we think that it is wise to remove it from the system. It seems that Clicon can be downloaded from its official website; however, the researchers at pcthreat.com still believe that this advertising-supported application can travel bundled with freeware and shareware, so you might install it during the installation of other applications. You should definitely pay more attention to the information in the setup wizard because there is basically no doubt that you have been informed about additional applications. If you cannot ensure your system’s security, we recommend installing an antimalware tool on the system. The easiest way to get rid of Clicon is to scan the system with an automatic malware remover, such as SpyHunter. This tool will not only erase Clicon, but also delete other unreliable programs that might have slithered onto your computer over time. There is no doubt that SpyHunter will prevent other serious computer infections from entering your system in the future as well, so we believe that it is worth spending money on its license. 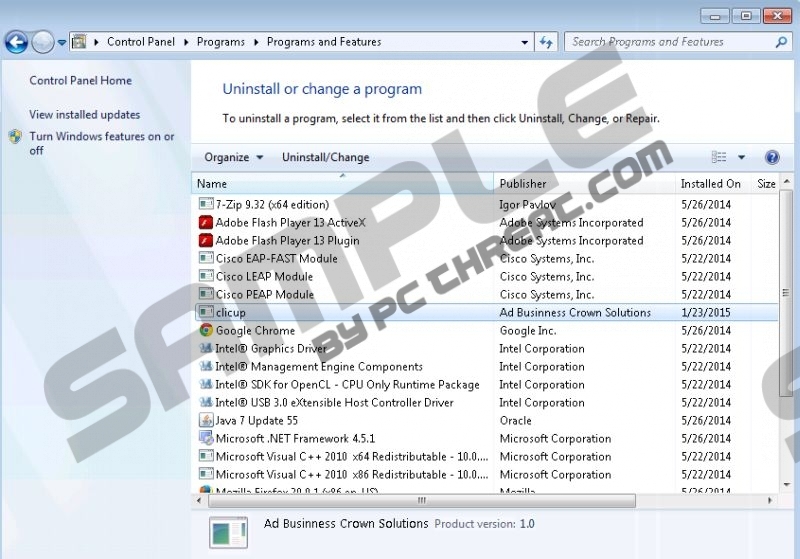 Select Clicon and then click Uninstall. Right-click on the adware program. Click the Uninstall button to delete it. Quick & tested solution for Clicon removal.